This function is able to delete all partitions on a disk. 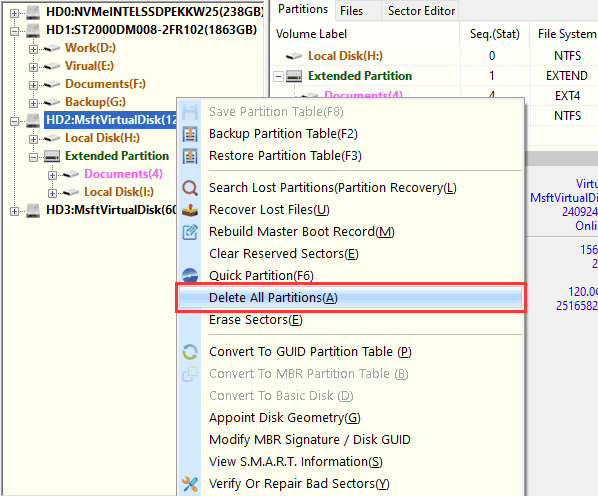 Step 1 Right-click on the disk and select "Delete All Partitions". Step 2 Click "Yes" if you are sure there is not important data on the disk. Step 3 Click "Save All" button from toolbar and click "Yes" button. To prevent data loss due to improper operation, the delete partitions operation will not be saved to disk immediately, it is kept in the memory until you save partition table.